I really like Pure and Simple. I would love to see more Bags!!! 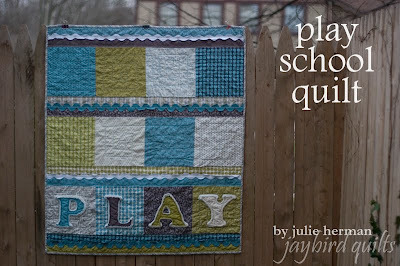 Julie Herman of Jaybird quilts shared with us this cute little quilt - It even comes with instructions! Find it here on the Moda Bake Shop! Enjoy and we will be posting more projects soon! YAY!!!! My name was picked. Thanks sooo much! congrats Paual....I'm totally jealous!! also, ms. sweetwater (heeheehee) just wanted to let you know I was scouring quilting stores while I was out one day and came across one that actually had Authentic charm packs and what not!! Do you know how happy I was? So I grabbed two charm packs and a yard of the numbers fabric (in black)..I was bummed that they didn't have any other authentic fabric but I was totally happy with what I bought!! When I do get my act together and create something I would love to share it with you...have a great day!!! GO PAULA!! Cute little quilt! I mentioned your blog as one of my favorites today on my blog! Thanks for all the inspiration! What a cute quilt! Love the applique, Play! Shucks...I'll just wait for the next giveaway. Thanks for sharing with us!